Contact John Olson or Debi Wells for information on how to participate. Definition of CERT: an organization of volunteer emergency workers who have received specific training in basic disaster response skills, and who agree to supplement existing emergency responders in the event of a major disaster. After completing both American Red Cross Disaster Action Team and CERT training in Delaware, George and Mary Drake recognized a need in SV for a team of persons to aid disaster victims until first responders from the Queen Anne's County (QAC) Emergency Management Services and/or Goodwill Fire Company volunteers arrive. So, in September 2008, they enrolled 15 persons in a QAC CERT class at Chesapeake College. With additional classes, the team peaked at 32 members trained in basic first aid, use of the Automated External Defibrillator (AED) and Cardiopulmonary Resuscitation (CPR). In 2016, with SV home building completing and many new residents, coordinator George Drake began efforts to rejuvenate the CERT program. Articles were placed in the Libretto and on internal communication networks for new membership. Several people were interested in CERT, and QAC was contacted for training but could not provide it; so Drake contacted Talbot County who accepted and trained new members. One of the newly trained CERT members was Debi Wells whose organizing expertise led her to become a co-coordinator of the SV CERT. She was instrumental in subject suggestion, recruitment of speakers for CERT meetings, and as a spark to the CERT group. During this period, the emphasis was on revitalizing CERT, honing skills and providing health and welfare information to SVers through a series of speakers, demonstrations, and field trips. There was a presentation, demonstration, activity, or field trip each month. See the Activities and Accomplishments section for some of these activities. 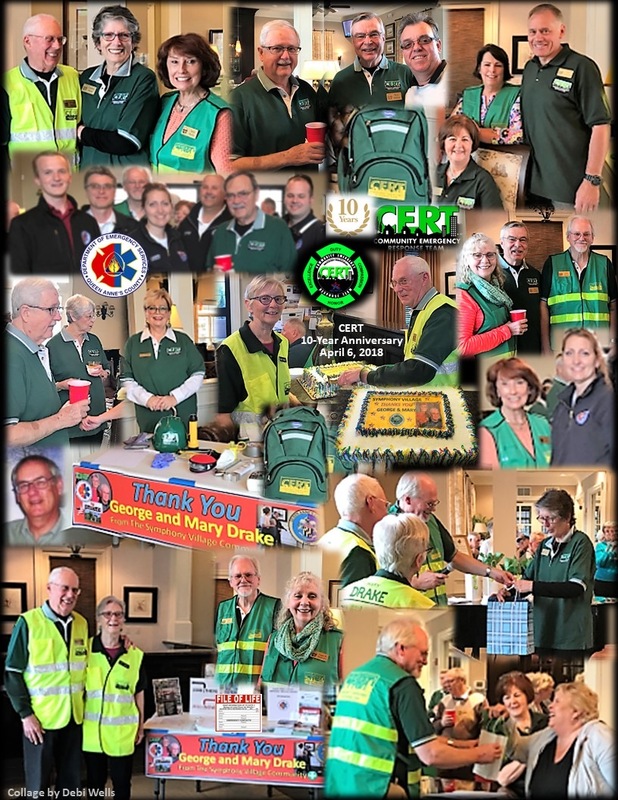 In April 2018, after celebrating the 10th anniversary of CERT in SV, George Drake retired as the CERT Coordinator and John Olson took over. Click here for a history of the Symphony Village CERT described through Libretto articles. Over the years, the SV CERT has kept an eye out for necessary improvements and modifications to our community and homes to help ensure our prepare and prevent accidents. To help prepare for potential emergencies the team has also conducted numerous activities and sponsored presentations for the community. CERT accomplishments, activities, and presentations are described in the following sections. Added a First Aid Kit in the gym area. Added a fire extinguisher in the clubhouse kitchen. Checked every home from June 2009-2010 for propane regulator/shut-off valves. Approximately 130 homes subsequently had regulators replaced or added, and shutoff valves at the house installed if not already in place. 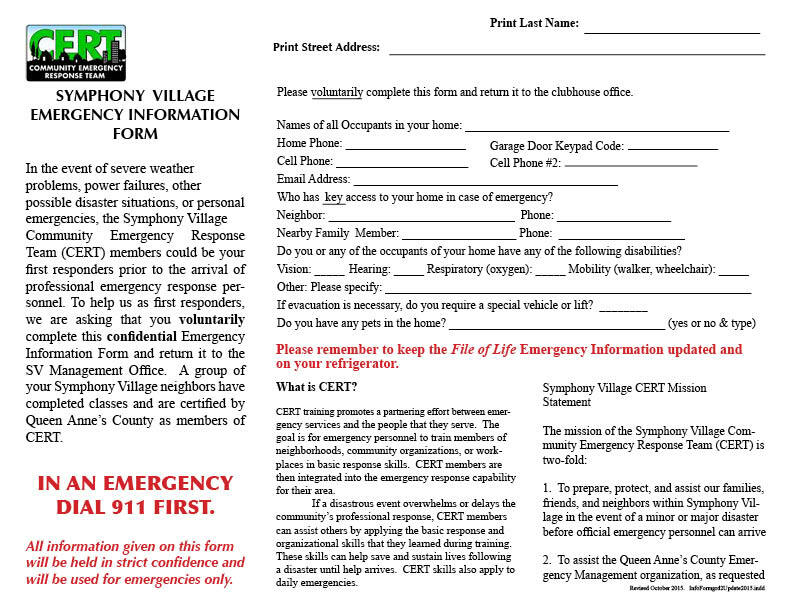 Developed the SV CERT Emergency Information Form for residents. Completed forms are confidential and kept in the Management Office. Emergency Information Forma are included in the Welcome folder given to each new resident. Developed a SV CERT Emergency Plan which has been used in exercises with the QAC Emergency Management Services and Centreville and Queenstown Fire Departments with actors acting as victims. Provided maps of SV including house numbers & fire hydrant locations to QAC Emergency Services, QAC Sheriff, Goodwill Fire, and Centreville Police for placement into all emergency vehicles to aid personnel in locating our homes. Placed procedures and photos on how to shut off all electrical power, water, hot water tank, outside water, and propane on CERT Web pages. (See below) Debi Wells has instituted and compiled a Resident Skills and Equipment List that is available to CERT personnel as an additional resource during an emergency. Coordinated with the Centreville Police Chief, Chief of Goodwill Fire Department, and the QAC Sheriff's office on the establishment the of SV CERT in order to work cooperatively with them in the event of emergencies in SV. Scheduling and servicing of all fire extinguishers. Weekly inspection and periodic maintenance of Automated External Defibrillators (AED) to keep them in compliance with Maryland law. Requested the SV Operations Committee to consider purchasing and installing a backup electrical power generator for the clubhouse in the event of an emergency. A study was done and the committee voted against the backup due to cost. CERT members were on-call during the “blizzard of 2010” to shovel snow from residents' homes if Emergency Personnel were called to a home. This team remains in place for future snowstorms. CERT surveyed SV in 2010 to determine the number of homes with decks (61) and whether they were considered as an egress to escape a fire. The current code only requires one exterior door as a means of egress so all SV homes are in compliance. CERT personnel assisted residents in securing outdoor furniture, etc. prior to impending hurricanes or very high winds. 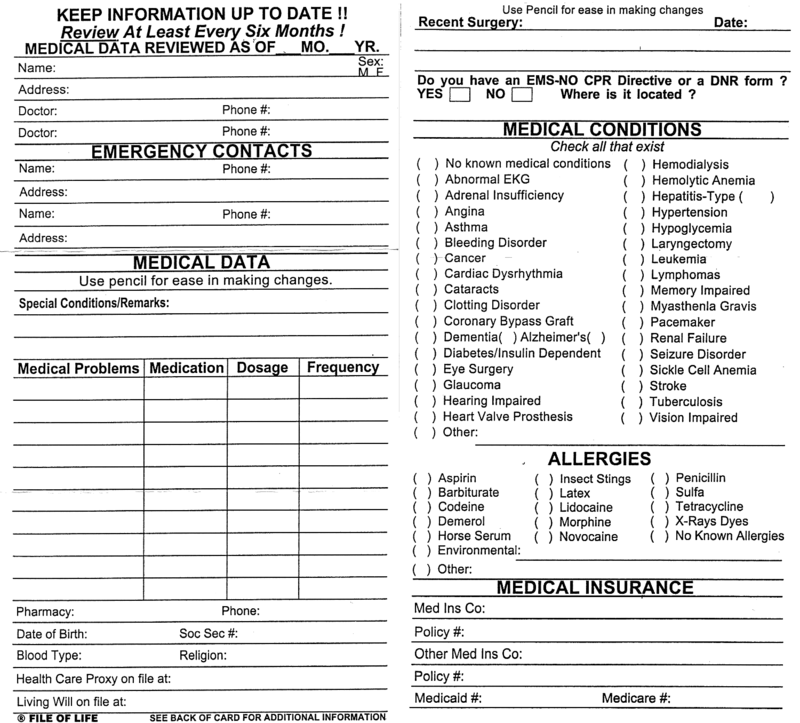 Files of Life, a summary of your health information that can be used by first responders, were distributed to residents. Files of Life are also included in the Welcome folder given to each new resident. CERT SV Happy Hours were hosted in June 2016 and April 2018. There were lots of great prepare questions asked, useful brochures distributed, contents of CERT bags shown, and new members recruited. CERT members installed Garage Door Wireless Keypads for any resident who purchased the Chamberlain Clicker Keypads. Once installed, it was requested that the owners complete or update the Symphony Village Emergency Information Form (now including the Key Code). Presentation of capabilities and procedures by the Goodwill Fire Chief. QAC Health Department nurses presentation on Lyme Disease and rabies. Home prepare Tips regarding Medications and Poisons. Presentation of a disaster simulation to challenge the minds of CERT members. Presentation of the services, accomplishments, and problems in the Centreville jurisdiction by Police Chief Charles Rhodes. Presentation regarding the services provided by the QAC Emergency Services Department by Director Scott Haas. They also demonstrated their paramedic equipment Presentation by Sheriff Gary Hoffman regarding the accomplishments and problems in QAC and the Sheriff's solutions. Videos were shown to CERT members as a review of all CERT procedures learned in classes. 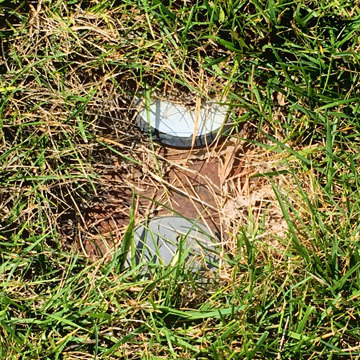 This was used as a “recertification” for our members, as there are no recertification classes offered in QAC or the area. Presentation on “How to Cope and Support Grief” by Ms. Jessica Bass — this was presented in December as it is noted as a period of grieving by many people. Visit to the QAC 911 Center and a presentation and demonstation by the 911 operators and the Emergency Operations Center Visit to Trooper 6 Medivac at the Easton Airport to include a talk by Trooper/Paramedic Sgt. Brian Francis. The talk included the helicopters use in medical evacuations and in search and/or search and rescue operations. Presentation by a Nutritionist on eating healthy at our ages. “Grandchildren prepare in Our Homes”, presented by SVer Joyce Orden Demonstration by Sheriff Gary Hoffman's K9 Corp. and how the dogs are trained and used to sniff out drugs or aid in search and rescue operations. Fire extinguisher use and practical exercise offered as retraining to CERT and to all interested villagers. This was held at the Maryland Fire and Rescue Institute Upper Eastern Shore Regional Training Academy. CERT has periodic meetings to update our members on procedures. All SVers are invited to attend CERT programs, lectures, field trips and exercises. Relevant information regarding health and prepare of the residents and SV homes are periodically submitted to the Libretto, the Daily Bulletin, and/or e-mail distribution. In an emergency, the SV clubhouse is designated as a temporary shelter for SV residents. Weekly monitoring of the two AEDs in the clubhouse. Maintaing six Family Radio Units that remain ready for use by CERT. Mr. Jim Bass of the Talbot County Department of Emergency Services has provided outstanding support in accepting SVers who are interested in CERT training. Four SV residents are licensed amateur radio operators, and they can provide emergency communications should both electrical power and cell phone communications fail. The CERT team is always looking for new volunteers. Contact John Olson or Debi Wells for information on how to participate. 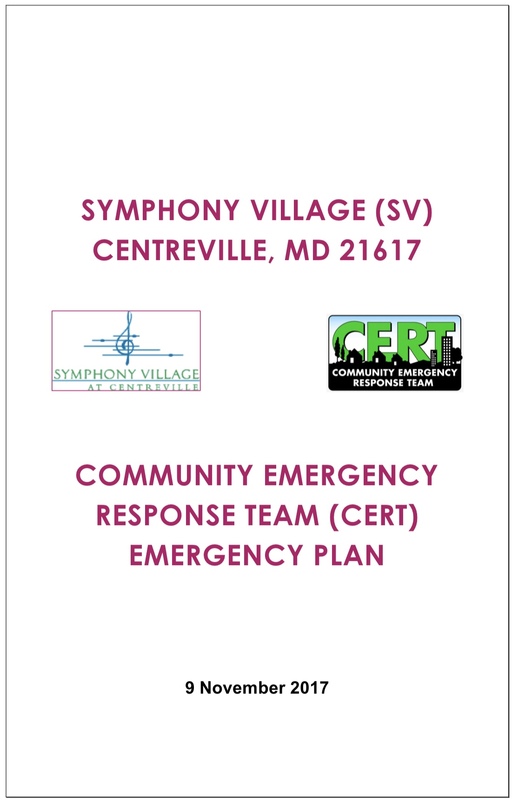 An Emergency Plan for Symphony Village was developed by members of the SV CERT. The total plan consists of seven parts as listed in the table below. Click on the links to view or print out the latest plan — all files are in PDF format. Identify hazards and possible mitigation measures. Identify resources and key contacts in the community, including Neighbor-to-Neighbor street captains. Increase the community’s ability to recover from a disaster. If activated (by Queen Anne’s County), provide guidance on how to mobilize. 1. SV CERT Emergency Plan This is the major part of the plan with information on risks, personal safety, CERT actions in a disaster, reference data, etc. Each homeowner should review the following sections on electrical, propane, water, smoke detectors, etc. to prevent emergencies or identify actions to take in case of emergencies. It’s a good idea to locate house main electrical, water, and propane shutoffs, and you should put a tag on them for future reference. In a panic situation, you will find them quickly and be sure of the correct shutoff. For even more details Click Here. To turn off electricity in the entire house, go to the garage and flip the LARGE Master Breaker Switch at the bottom of the breaker panel. To switch off only portions of the house, flip the applicable circuit breaker in the panel to OFF. If your box is not labeled as to what the individual circuit breakers control, it would be a good idea to do so. 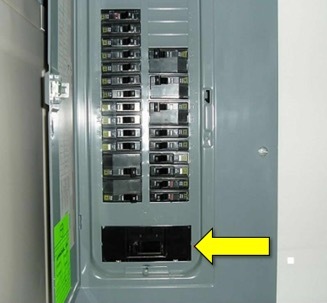 Never block your circuit breaker panel with stored items! To turn off all propane going to your heating unit or/and fireplace(s), locate the shutoff immediately outside the house (in the back against the wall — see photo at right). Turn the valve one-quarter turn by hand or with a pair of pliers (depends upon your type of shutoff). When the valve is open, it is aligned up and down with the pipe (parallel); when it is closed, it is crosswise (perpendicular) across the pipe. CAUTION: If you have to turn off the outside gas, contact your propane company to have them turn it back on. If you have a spare propane bottle for your grill, DO NOT store it in the garage. If the bottle should leak gas in the garage, there is a chance of an explosion from any stray spark. Turn the handle clockwise until fairly tight. Don’t force it! 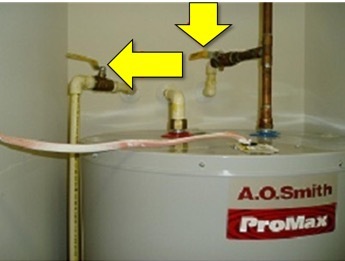 Be careful not to twist or pull on the shutoff or pipe. Turn off water to your outside faucets from the inside in late fall to keep the water lines and faucets from freezing. The shutoff valves are located inside the house, probably under the kitchen sink and under the bathroom sink or in access panels. Close the valve by turning to the right (clockwise). 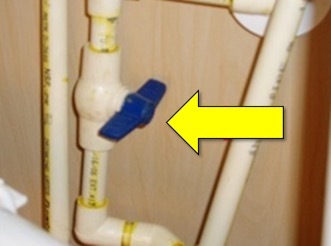 Then go outside and open the faucet to drain out any water in the line. The shutoff valves for the hot water heater should be labled with the words “on” and “off” for the direction for each. If not, usually counterclockwise is on and clockwise is off. Your valves may look different than the ones in the display. They may also be in different places, depending on the model of your house. In any event, you should locate them and make sure you understand how they function. HINT: Once you have located your various shutoffs, tag them so you can easily find them when you need them. In an emergency, to completely shut off water coming from the city into your house, open the circular cover out by the curb (see picture below). There is a 5-sided nut that needs to be turned. Assuming you do not have a 5-sided socket, a pair of pliers or vise-grips will do the job. When the lid is off, look inside for a one-quarter turn valve and use your pliers or a wrench to turn the valve one-quarter turn to the right (clockwise). 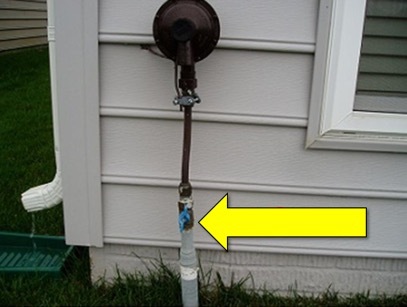 If there are two valves, be sure to turn your valve — the one toward your property. 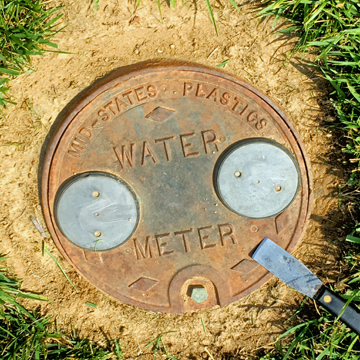 Is your water shutoff and meter access grown over with grass? If so, you should trim around the access so that the water supply could be located and shut off if there is a water leak between the town water supply and your house. Generally, there is a water shutoff access between each two homes; look for it between the curb and the sidewalk. If you are not already on a periodic preventive maintenance program for your heat pump, contact a HVAC contractor and get on one. If snow covers the vents of your heat pump, use a broom to clear them so air can circulate around it. When using ANY type of outdoor grill, it should be at least 3 feet from the house. If the grill is too close to the house, the heat will warp your siding — or worse, the flames could ignite the siding. Always keep the propane canister outside! Check all smoke detectors twice a year at daylight savings times. Press the TEST button to see that they alarm. Replace the battery at this time also. If you hear a chirping sound coming from the alarm, you need to immediately replace the battery. Check them to see that the needle points to the green (full) area. If not, replace them (or get a recharge if they are rechargeable). Periodically turn the extinguishers over and shake them a couple of times to make them ready if you need them. Its easy. It's simple. It's free. Just do it while your health is good! Fill out one for each occupant of the home. 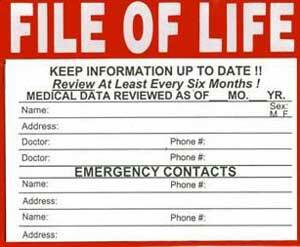 The File of Life is a summary of your health information that Queen Anne's County Emergency Personnel (EMTs, firemen) are trained to look for hanging from your refrigerator. Filling out this simple form, attaching it to your refrigerator with the included magnetic holder, and updating it frequently with your current information can save valuable time and perhaps your life. Fill out the form in pencil, slip it into the provided sleeve, and attach it to the refrigerator. The file contains your name, address, doctors, emergency contacts, medical data, pertinent personal data, medical conditions (checklist), allergies (checklist), and your insurance information. Then, update it when you have changes and/or review it each six months for updates. It's a no brainer! Get a File of Life for each household member from the Management Office at the SV Clubhouse or call Eileen Rowley (703 946-1075) and leave a message, or send an e-mail to: Eileen@rowley.org. To help us as first responders, we ask that you voluntarily complete this CONFIDENTIAL Emergency Information Form and return it to the SV Management Office. The form contains information about who the occupants of the house are, who has key access to the house, if anyone has any disabilities, and other information that might be useful to first responders in an emergency.